August 21, 2017 November 30, 2017 JohnGames / Gaming / Kickstarter7 Comments on Scrooge – The Board Game – Coming to Kickstarter September 2017! Hello everyone, and welcome. Today I am doing something a bit special. A wee while ago, I attended the UK Games Expo for the purposes of talking to games developers, and start getting my name out there. I succeeded to some extent, and this post is a result of that. 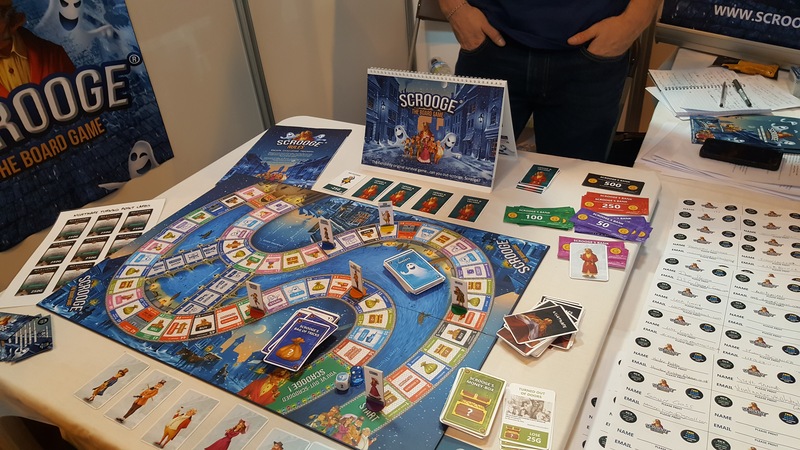 I met some lads who were developing a new game called “Scrooge – the Boardgame”, which is due to appear on Kickstarter this September. They very kindly sent me a prototype for review. Players take on the roles of Dickensian characters who must move around the streets of London, hoarding their own fortune whilst simultaneously trying to “Out-Scrooge” the other players. If a player runs out of money, they are out of the game. Should a player land on the last space on the trail, they get to participate in the Moment of Truth Challenge in an effort to redeem Scrooge. If they succeed, then he stops being a miser and becomes a kindly gentleman. Should they fail, then they may be able to try again, but maybe not before they run out of money or someone else beats them to it. Players take it in turns. They can either pay exhorbitant amounts of money to move specific numbers of spaces, opt to play a ghost card that has the rule “Replace a turn” or they can roll one or two of the dice. The player can also choose to move forward or backwards, with every step back being worth 50g. The two dice are six sided, with one being a standard D6, however the other die has 0,1,2 and -1 and -2 on it. This “Marley” dice adds a bit of extra randomness to the game. Every street that players land on has an action to resolve, be they to buy or sell Nightmare Cards, gain or Steal Ghost Cards, play Scrooge’s Bags of Tricks on other players, or even lock you up in Debtor’s Prison. (Detailed rundown of cards and spaces on the board on the video). Players can opt to hurry ahead to try and get to the Moment of Truth first, in order to win the game, however the leading player is always the player who is hit by Scrooge’s Bag of Tricks cards, so some players will be understandably be more cautious, hoping to move slowly and gain money by the occasional retreat whilst letting other players expose themselves to greater risk. The winner of the game is the first player who can succeed in the “Moment of Truth” Challenge at the end of the trail. The Moment of Truth is a game of chance, that theoretically favours Scrooge, which costs 500g to play. Though, despite favouring Scrooge, players can mitigate his advantage by making sure they have a good hand of Ghost Cards, and perhaps a powerful Turning Point nightmare active before starting. In fact it is absolutely vital that players do this in preparation, as once the challenge starts, the other players have the option to help Scrooge in a last gasp as they want to be his redeemer, rather than you. (more detail on the video). In my mind there are two versions of this game. There is the family version, where parents and children play at Christmas. They race around the board trying to be the first to get to the Moment of Truth, to be Scrooge’s redeemer. They hop around streets of London, deal with financial ups and downs, avoid prison and generally try to stay afloat. Like Monopoly, but without the buying of property. And then there is the other version, which I see my friends playing more. Where players consciously retreat to build cash reserves, and remove risk from themselves whilst chucking Bags of Tricks at the person brave, or foolish, enough to be in the lead. This game is considerably more sneaky and backbitey and is more reminiscent of Munchkin. In truth, Scrooge is somewhere between the two and that is no bad thing. This game is easy to learn, easy and fun to play, with various options available to you. Truth be told, next time I play, I suspect we will end up playing for far longer than is anticipated as we players try and bankrupt one another. But that seems entirely appropriate for a game named after the world’s most famous miser. For more information you can like the Scrooge Facebook Page or join the Scrooge Facebook Group. It seems like a monopoly mixed with Scrooge kind of game.